Instead he floated Tony Meloto, the housing grubstaker, and SMART MVP, non-politicians both. What he was telling the LP is that he doesn’t need the heave-ho of one geographical kingpin. His pronouncements merited media front pages. 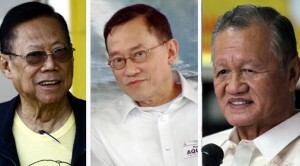 He lawyered for JPE, Jinggoy, and Bong Revilla expressing his legal mind, saying “as a practicing lawyer once,” the Ombudsman’s plunder evidence against the trio was a “dud”. He was the oasis of those charged before the graft agencies by the Aquino administration in its quest for the right path. As if on cue, PNoy uncles pronounced their preference. “I heard the Aquino sisters are for you. I thought that’s right. Even the uncles, Uncle Peping and Uncle Paul,” Butz Aquino said in a speech that capped the wreath-laying ceremonies at the airport on August 21. Armed with this formidable political ordnance, Binay feels he is on top of the world. By 2016, he has a leasehold right on Malacanang. noted Korina Sanchez, won’t have his day in court someday. They are out of the commerce loop on PNoy’s days in the Palace. A brother-in-law tried to swing a deal with a Czech ambassador in the supply of light train from Inekon, a Czech train fabricator. Understandably, this GMA gofer wants to return to the Palace via the Binay bandwagon. Al Vitangcol was a sacrificial lamb. This Inekon deal, had it gone into fruition, could have extended beyond 2016. The contract speaks of long term supply of light trains and could have made the brothers-in-law within Manny Pacquiao’s league, billionaires all. In the end this business arrangement was traced to the Office of the Vice President. 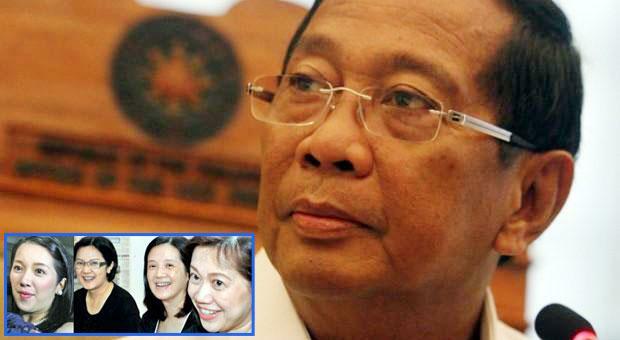 Under a Binay Presidency, influence peddling by the sisters is no crime. Conveniently, the sisters were shielded from the prying eyes of the media as the story was killed promptly by the firing of Vitangcol. “All politics is local”… Thomas Phillip “Tip” O’Neill, Jr.
Then again the underfunded struggling Makati local opposition went to town. Why would the Senate dignify the travails of an ignored opposition in one local government?, Binay asked. This ragtag team headed by Kado Mercado and lawyer Rene Bondal was resoundingly and repeatedly rejected in all local elections. This is all pure politics, the Vice President countered. What Binay forgets is that Makati City is the premier city of the Philippines with the highest local revenues. The Binay landscape was never the same again. And the Binay ratings went down. For two straight months, documents and testimonies of corruption for the last 28 years were litanized. Filipinos never get tired in shooting icons down especially at their expense. But it can be asked, why did it take 28 long years before this thievery comes to light? Did Binay fly towards the proverbial flame and got himself scorched in the process? The Binays it appears are living it up in Dasmarinas, Forbes, Caong, Rockwell, and the Batangas encomienda. If Elpidio Quirino has his Orinola, the Binay Hizzoner in Makati can not be denied: his house is equipped with an Otis top-of-the-line elevator. Much proof of wrongdoing has been disclosed in the construction of various Makati government skyline. For the past 60 days the Inquirer chronicled revelations after revelations where the Binay patriarch merely sweeps these as mere muck and politics. The amount of public funds involved shames Renato Corona and Janet Lim Napoles. While systematic plunder attended the disposal of PDAF and the DAP, it now appears that there is a MAFIA among the heads of offices of Makati, the Bidding and Awards Committee, the local CoA, and of course the diminutive city mayor. Politics in this country is college politics: the amateur and the idealistic rule the roost. Binay has been successfully portrayed as no Don Quijote. He is the incarnate of Ferdinand Marcos with an equally rapacious better half, his benchwarmer, Dr. Elenita Binay. “Kado, nasaan ang pera ko?” Mercano narrated in the subcommittee. “Binigay ko na po kay Nancy. Mukhang may nangungupit sa loob-loob ko. Kaya po pinalagyan na ng lock ni VP ‘yung mga bag,” Kado continued. His children? The cheap chiffon cake best describes them. IN 1986 both FVR and JPE were ensconced at Camp Crame. The forces of General Ver were massing at nearby Ortigas empty lots awaiting the orders from Marcos. The lull gave the people opportunity to mass up EDSA and insulate the duo. Mass indignation gelled and one by one the Armed Forces of Marcos disintegrated. We saw the capitulation of the tank commander, the air and helicopter brigade, the policemen of General Fred Lim and Prospero Olivas, the regional commands, rendering Marcos and his family isolated. We saw this spectacle in the Erap presidency. Short of becoming president, Binay will never see the light of day by the Pasig. The desertions start trickling in. Chiz Escudero is the first to abandon ship. While he was at the helm of the Binay campaign for the Vice Presidency in 2010, by all accounts, he is now sidetracked by the novato spokesmen of the Vice President. 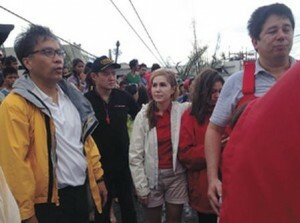 Like Diogenes of old, the bachelor senator is looking for his old friend Rambotito with the bandolier. Instead what he’s seeing is a forlorn be-dimpled Vice President trying to decipher where Corona, JPE, and Napoles went wrong. Erap is next. When Binay expressed his preference on the billionaire Manny Pangilinan as running mate over Jinggoy, a fuming Erap was quoted as saying, “tingnan mo yang si Nognog, talagang ‘di makapagtitiwalaan. Wala na yan.” Erap when pressed who is behind Oplan Nognog staunchly denied that the LP’s Mar Roxas is behind it. “Kilala ko si Mar. Mabuting tao yan. Hindi gagawa ng ganyan yan.” He should know he says because Roxas was his DTI Secretary in 1998. This is the best endorsement of Roxas so far. The Chinese community who made down-payments for the Binay campaign is now mum over the Binay imbroglio. Has the AMLAC the goods of Binay? It appears so because President Aquino himself has no comment on the ongoing Binay probe. Is Binay looking for assist from the President? Those in the know say that there were attempts by Binay to personally see the President but PNoy conveniently went somewhere else: Bali. For several days PNoy was in Europe and America. Binay was never made the caretaker as was done during the first 24 months of Noynoy’s Presidency. 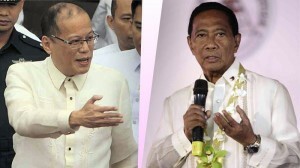 Vice President Jejomar Binay appears to be moving to cut his ties with President Aquino as he slams for the first time the latter’s controversial decisions, like allowing the Disbursement Acceleration Program (DAP) that the Supreme Court has declared unconstitutional. Binay, 71, also took a swing at the way the Aquino administration was allegedly mistreating former President Gloria Macapagal-Arroyo while handling with kid gloves Philippine National Police Director General Alan Purisima, who like the Vice President is alleged to have amassed unexplained wealth. It was a combative Vice President who spoke at the 5th MCLE (Mandatory Continuing Legal Education) Accredited National Convention of Public Attorneys at the Manila Hotel. PNoy is a dear brother to the sisters. Badmouthing the kid brother is a mortal sin in the Aquino family. Now it gets clearer that Binay is just a journeyman. He no longer thinks rationally because lately he hasn’t slept the sleep of the just. The silence of the Aquino sisters is very telling. With her copious adrenaline, Kris wouldn’t be denied. Maybe we’ll hear it first from Boy Abunda whom Binay said had his karma. But the withdrawal of support from the sisters might mean anti-climactic. But to some it may mean a lot.